It's that time again...but first I must apologize for the lack of updates on Emily. I also want to apologize upfront for typos, traveling and iPad, easy for that to happen. This will be a short update, but a quick update of where we are. It's been a long two days of traveling and later tonight we will have made our destination. It will be another late night!!!! 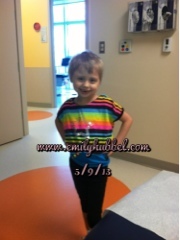 Tomorrow Emily has clinic with port accessing and count checks and then her MIBG injection. Thursday she has her MIBG/CT scan and then afterwards we meet with Dr. Sholler for results. Needless to say, dad and I are feeling "scanxiety". Obviously we are hoping to come out from scans with less disease or even stable. I am going to end this, but I want to say thank you to everyone who continues to follow us in this journey, pray for our family and most of all Emily. Thank you for your love, donations and support. Your emails, messages, words are each read and much appreciated. If you have your "Team Emily" gear, we ask that you wear them either tomorrow of Thursday and share your pictures by tagging us on Facebook.